Brown, about 1/2-inch in length, with two dark, longitudinal stripes on the shield at the front of its body. Cockroaches pose serious health risks to your family or business. Controlling German cockroaches takes expertise and persistence due to their rapid reproductive rate. At least 95% of the populations must be eliminated during initial treatment or they will return. Baits are a particularly effective form of roach control for this species, but correct placement in cracks and crevices near harbourage is critical. The Oriental cockroach commonly inhabits sewers and storm culverts and will enter buildings through floor drains. It survives quite well outdoors in firewood, leaf litter, sheds, doghouses and similar locations. During the colder months, oriental cockroaches re-invade homes, establishing themselves in basements, cellars and crawl spaces. Scavenger; eats almost anything. These cockroaches are a particular focus of roach control because of their strong odour and because they feed on filth. Light or dark brown; about 1/2-inch in length. Both males (long and thin) and females (more oval) have lighter-coloured bands running across their wings. Like German cockroaches, brown-banded cockroaches are found in kitchens and bathrooms. However, because they require less moisture, they are also found in bedrooms, living rooms, closets, bookcases, even light switches and furniture. This adaptability can make roach control difficult. Brown-banded cockroaches are omnivorous and will eat anything that possesses organic matter, even organic glues used in books and cabinets. Preventing cockroaches from entering your home in the first place is critical to roach control. Inspect all incoming food goods, boxes and used furniture and appliances for cockroaches or their eggs, and remove them with a vacuum or by otherwise killing them. In commercial facilities, avoid storing food items in cardboard boxes on shelves. In homes, store paper bags in the garage or away from the kitchen, utility room and bathrooms. 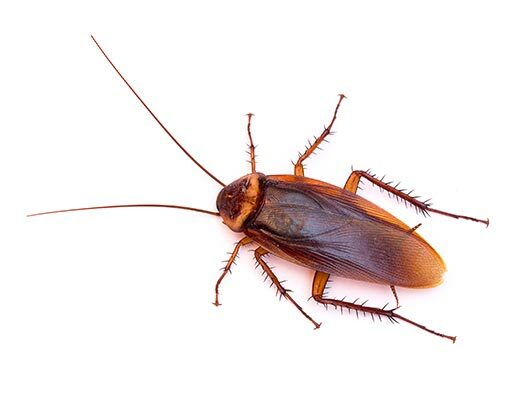 Sealing holes and cracks around plumbing pipes under sinks, behind toilets, etc, is essential for roach control.Cockroaches pose serious health risks to your family or business. Good sanitation, a thorough inspection, and professional baits/treatments are all part of an effective roach control strategy. Cockroaches pose serious health risks to your family or business. Good sanitation and habitat reduction is the key to effective roach control. Also it is important to vacuum and surveillance, a professional baiting program, and careful sealing of cracks to help reduce or eliminate a cockroach population. Because cockroaches are nocturnal and experts at hiding, successful roach control requires special equipment, materials and expertise.